It only took minutes for us to learn that a trekking pole is a wonderful accessory for the beginning barefoot hiker. Barefoot hiking was our entry point into the forefoot striking world in 2009 and it would be another year before we hit the trails with our first minimalist shoes, Vibram 5 Finger KSO's. We were 'learning by discovery' with no information on the subject of barefooting and the first lesson was clear: "Do not heel strike." But of course, we only learned that by doing it and repeatedly it felt like we would have dumped over backwards from the shooting pain of hitting a rock if we hadn't happened to have been hiking with a single trekking pole each. The crutch gave us the margin of safety we needed to turn minutes of barefooting into hours of hiking in rocks during our first week without shoes. Use the pole as long as you feel you need it to be safe and ditch it when you literally hit your stride. It may be counter-intuitive, but barefoot hiking is easier going uphill than downhill or on flat terrain. It's when going uphill that your foot hits the surface with the least force and you have a little more time to adjust your foot placement, even compared with walking on level ground. And I think the unevenness of trails is less weary-making than when walking on smooth surfaces in which each foot placement uses exactly the same combination of muscles. I recommend immediately aiming your bare feet towards a dirt or sandy uphill trail with a pole in hand rather than starting your barefoot hiking adventure on level pavement. A tiny pair of camper's tweezers always accompany us when hiking. They are occasionally handy to have on hikes and more so when bare footing. The big splinters can often be extracted with bare fingers and the little ones will usually wait until we are in for the night, but it's nice to have the option of plucking the slivers from your feet as soon as they become irritating. If the skin on your heels is prone to cracking, the cracking may become worse with barefooting because shoes are no longer trapping the sweat from your feet. The tendency for the skin on Bill's feet to crack, fray, and tear became progressively worse when he transitioned from sandals to minimalist shoes to occasionally barefooting. Even my very sweaty feet began developing deep cracks around the heel when I wore less and less on my feet. My issues with the cracks were purely cosmetic: the deep cracks became permanently stained and I didn't like always looking dirty. For Bill however the skin breaks meant he had lost the protective barrier afforded by intact skin and it could also be painful. Our dermatologist recommended AmLactin Moisturizing Body Cream and it's the best remedy we've found for both preventing and healing skin damage from dryness. The lactic acid in the product stimulates sloughing of the skin, which exposes new, healthy layers sooner than they would otherwise appear. It seems that the process would make the skin overly tender, but neither of us have found that to be the case. We both see significant improvement in 1-2 weeks after using the Amlactin twice a day if our skin has become troublesome. Vivobarefoot Running Sandals [L] & Teva Zilches [R] are my favorite barefooting back-up shoes. I can sometimes barefoot hike for 3-4 hours but still consider myself a novice and I always carry minimalist footwear with me as "Plan B". I can't imagine being able to traverse gravel without slowing down or donning shoes and welcome the option of using footwear if I need to pick-up speed or am tired of the continuous concentration required for barefooting on some trails. Long stretches of unexpected snow or slush on a cold day can overly chill my feet, which makes them much more sensitive to prickly particles on the trail. An upper-less sole like on a sandal is enough to retain some warmth in my feet while crossing snow or slush and to keep the fun in bare footing on the drier ground. And unless I've done the trail before, I prepare for unwelcome surprises for bare feet by always carrying some footwear with me. It only took a few encounters with cholla cactus spines in the Mojave Desert to decide to always carry pliers with us when hiking to extract them from our footwear. Bill bought the smallest multi-tool he could find with pliers because only pliers would do the job but they didn't have to be big. The travel version of the Peet Boot Dryer is highly effective in drying minimalist shoes or boots. "Everybody's shoes stink" was the podiatrist's reply when I commented on my stinky minimalist shoes. And one doesn't have to talk with a fellow Vibram 5 Finger wearer long until the conversation turns to "5 Finger Stench." One woman hoses them out after every wearing, others follow the manufacturer's advice and throw them in the washing machine, and some wearers try to ignore the smell. I personally had tried periodic scrubbing of my 5 Fingers with a grout brush and detergent and used shoe powder between washings, with limited success. But the foot doc felt there was only 1 solution, which is using Peet electric boot dryers to get them thoroughly dry after each wearing. I bought the travel size boot dryer for my lifestyle that involves living in a small truck camper 6 months of the year. This low-end model usually retails for $45 but was available for $30 from Walmart's online shopping service. Each retailer has a slightly different name for the product, with the manufacturer calling it "Go! Peet". And the foot guy was right, overnight treatment with the boot dryer got my minimalist shoes dryer and fresher smelling than hours in the desert sun. 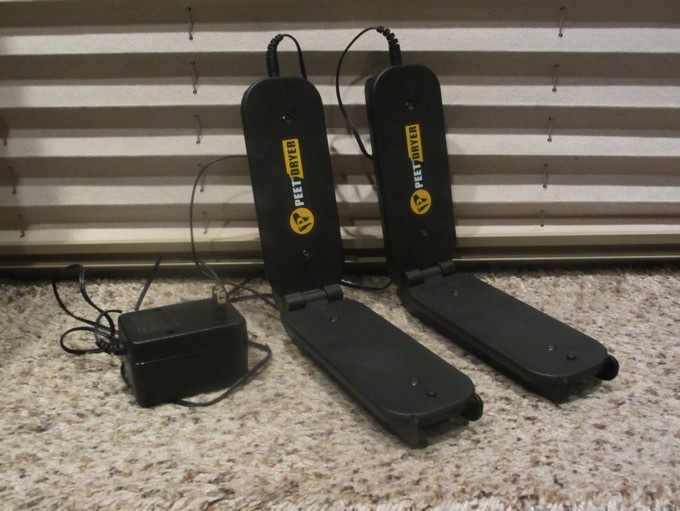 In addition to solving the stinky shoe problem, we are thrilled to now have a way to dry our snow shoeing and cross country skiing footwear when on the road in our camper. The travel model will also run off the12 volt cigarette lighter plug-in in our truck and sweaty boots seem to dry in as little as an hour. The podiatrist also commented that the sweatiness of people's feet increases when their feet become more active with barefooting and using minimalist shoes. So, if you have escaped this problem all your life, it may be lurking around the corner. When the podiatrist was out of the room, his assistant also mentioned that a splash of pure Tea Tree Oil on my feet would also help with the stinky shoes. Someone had recommended Tea Tree Oil to me years ago but I transferred it into a plastic bottle for overseas travel and it slowly dissolved the container. But this time I left it in the glass bottle and was happy with the results on my feet. We've had durability issues with every minimalist shoe we've bought though some hikers on the trails have no complaints at all with the same products. I think that my thick toes and my inward-pointing big toes accelerate the wear on the fabric between the toes on toe-pocket shoes like 5 Fingers and Fila's. We've taken to gluing small patches of thin bike inner tubes on new pairs of toe-pocket shoes because it is easier to reinforce them when they are new than to repair them when damaged. We prefer Super Glue Gel to the more fluid Super Glue for adhering the inner tube patches to the toe pockets because it is less likely to penetrate the fabric and create a rough spot inside. Do test it on all material types involved because the Super Glue seems to melt one of the fabrics on my Fila Bay Runners. The Gel is easy to work with for re-adhering bits of sole material also. A woman at a bead shop recommended epoxy over Super Glue for general gluing projects, so we are now also experimenting with epoxy and Shoe Goo. Teva Zilch sandals with a big toe loop became my favorite hiking 'boot' in 2012 despite its less aggressive sole. A smoother surface to begin with meant the sole didn't quickly degrade like Bill's Merrell's and Vivobarefoot's but the Zilch's insole shredded after a month of use. Now, after every couple of wearings, I repair the insole with Super Glue Gel or epoxy because the rest of the shoe is in good condition. This stream of wear problems with our minimalist shoes has taught us to always keep a glue or epoxy handy for making repairs to extend the life of these shoes. 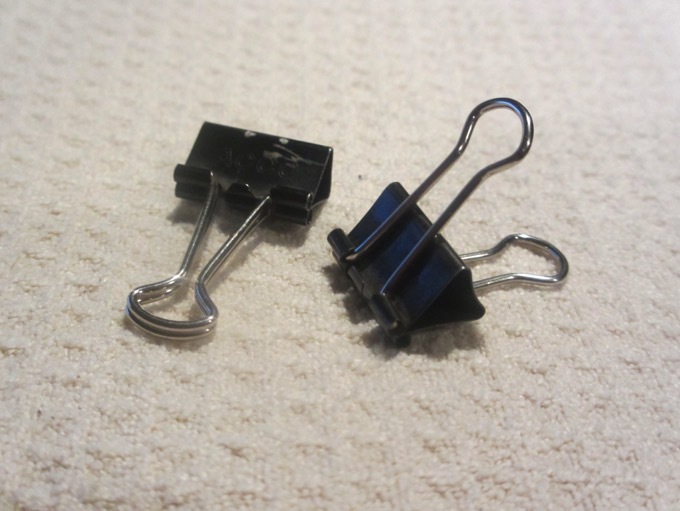 Metal binder clips…so that's what they are called. We both always wear long pants for sun protection when hiking but our old standbys were sized for regular shoes and tended to drag on the ground when in minimalist shoes or when barefooting. And especially when wearing rubbery tipped toes like 5 Fingers, one can easily trip themselves in the excess fabric of their own pant legs. As a consequence, we both like to nip-in our pant legs at the opening when hiking to keep us on our feet. Bill is content with using rubber bands or the elastic straps he makes for solving the same problem on the bike but I have always preferred a little more tailored look at the ankle. In the past I've sewn a pair of snaps on the inside of some pant hems to fold in the excess fabric and have also used a button-and-loop system as well but this summer necessity forced me to discover an easier, universal solution: metal binder clips. Those are the wedge-shaped, metal pinchers used to secure a stack of papers that have become too thick for a jumbo paper clip. They come in several sizes but the small ones work well with my lightweight fabrics. I inwardly accordion fold the excess fabric of my pants at the hem towards my leg and clip the 2 layers of fabric together at the bottom edge so that the clip and the little handles tuck inside my pant leg. By using the small clips, I don't even feel them once they are in place and they don't show. Of course the pants look a little odd, leaning towards the look of a harem pant, but it beats the alternatives. And surprisingly, I've never had a clip move out of position when on the bike or when hiking. They are cheap, readily available, small enough to keep plenty of them handy, allow me to easily vary the width of the leg, and give me the clean look I want at my ankles. They are also a boon for pants that have zippers or draw cords near the hem that make shortening the pants a major sewing project. I'd all but given up on ever doing much barefoot hiking and then quite unexpectedly in the fall of 2012 we were having a blast going bare in the SW. We finally understood that the Mojave Desert with its Jumping Cholla cacti is a looser for barefooting and the presence of the cacti also requires care by minimalist shoe hikers. However destinations that are on the edge of the Mojave, such as Snow Canyon and Zion listed below, are just fine because there are so few chollas out there. 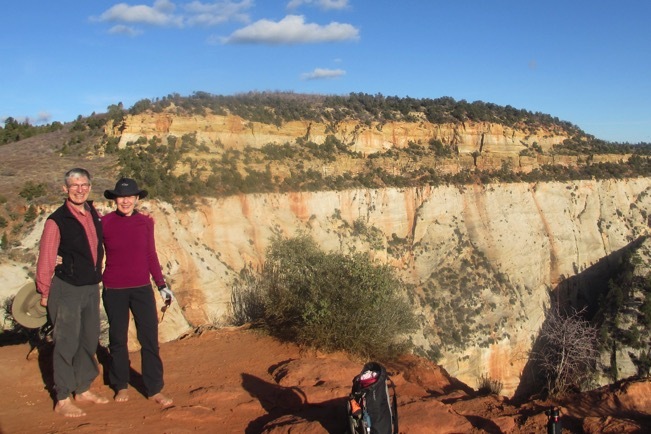 Here are the places we happily enjoyed hours of barefoot hiking. Happy feet at the top of Zion's Observation Point Trail too close to sundown. The trail from Weeping Rock to Observation Point is 8 miles roundtrip and I was able to barefoot roughly half of it. The sand and sandstone was a breeze, even with dried plant material sprinkled in. What was challenging was the concrete path built in the 1970's, much of which was texturized to have a rough, harsh surface. We were short on daylight hours so I needed to keep my speed up, which made the concrete harder to navigate. I often slipped on my Vivobarefoot Running Sandals to traverse the long stretches of concrete. Absolutely any footwear will do on the concrete because all you need is sole protection: there is no scrambling, no need for high quality traction. Many of the trails in the valley of Zion and along the river are fine for barefooting. We did pick-up some goat's head thorns in our feet and shoes and found that walking on the center of a sandy path was often safer for bare feet. This sweet little park is barefooting heaven. I did all but a few minutes of the 7 mile loop through Padre Canyon to the road barefoot. This trail and many of the other trails in the Park are primarily sand and sandstone and are delightful on the feet. Occasionally there are patches of lava, some of which can be picked through in bare feet and others are more comfortably done in footwear. Most of the time a slip-on like Vivobarefoot Running Sandals are sufficient but I took comfort in having my Teva Zilchs with me in case I needed the reassurance of a little better grip. Mesquite Dunes near Stovepipe Wells is a grand place to strengthen your feet. We went for 3 hikes of about 1 1/2 hrs each in these dunes just for the conditioning for our feet and leg muscles. Foot wear helps in getting in and out of the parking lot or into the nearby campground though there is no other need for footwear here. Take your lunch and enjoy the views and following animal tracks. Golden Canyon to Zabriskie Point is a worthwhile barefooting trek. The sometimes gravely wash from the Golden Canyon parking area to the fork for Red Cathedral (rocks) is very slow going barefoot and you may prefer to indulge in footwear for one or both directions on this segment. But once you turn-off onto the trail to Zabriskie Point at the Red Cathedral junction, you can barefoot the rest of he way to the Point. As often is the case, it is easier to barefoot going uphill to the Point than it is going downhill. Nothing technical about this trail so any footwear will do for back-up. Mosaic Canyon has a rocky wash similar to Golden Canyon, some of which can comfortably be done barefoot. The 4 main hiking trails from Yosemite Valley offer some barefooting opportunities, as does the dirt trail around the valley floor. I did the Upper Yosemite Falls trail, which has about 3,200' gain barefoot, though it was slow going downhill because of the rocks. I wouldn't rely on a slip-on shoe for back-up at Yosemite because the granite grit on the rocks on steep portions of the trail can be a severe skidding hazard, though even my relatively low traction Teva Zilch's were fine in Yosemite. Portland podiatrist Ray McClanahan is earning a national following among bare footers and minimalist shoe wearers. He has broken rank with his profession and doesn't follow the party line that feet are pitiful, poorly designed mistakes of nature that must be stiffly shod to survive at all. He's gone from a "surgery & orthotics" remedy for the common foot ailments to "less shoe is better" approach. McClanahan has a series of YouTube videos covering the common foot ailments and his simply treatment plan that solves most problems. If you are still in the skeptic's corner about minimalist shoes, watch his 12 minute video "Origins of Natural Foot Care with Dr Ray McClanahan." It combines his personal and professional journeys that changed his thinking and the logic of his treatment model: www.nwfootankle.com. From the homepage, click on Foot Health at the top, then YouTube Videos at the bottom of the left column and select the topic of interest to you. All of his other videos and articles are much shorter and I've found them to be very informative as well. In addition, he is a nice man and the only person in the world to look at my very odd feet and enthusiastically say to me "You have beautiful feet!"